Are you looking for a way for students to learn new sight words and review sight words in a fun and engaging way? This Super Heroes Dolch PrePrimer Pack is what you need! Each high frequency word page contains sections that allow students to learn a new sight word PLUS review 2 other sight words! 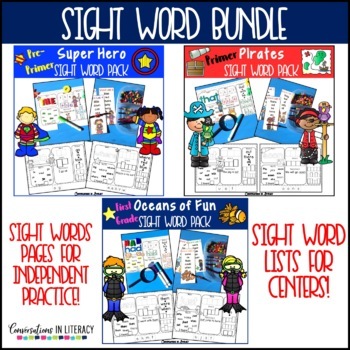 This sight word pack is a fun and engaging way to learn AND review sight words on each page of this Sight Word Worksheets and Centers Bundle! Each page contains a new word to learn and practice PLUS review 2 previous sight words. I have ALSO included sight word cards that can be placed into centers for students to use to read, review, and build with letter beads, magnetic letters, Play Doh, etc..
✎ Read & Draw It: Read the sentence and draw a picture to show comprehension. This resource works great for whole group, small group reading, literacy centers, and RTI intervention groups.